Irish Champion Pathfork, who will stand at the Sandown Stud this year, has enjoyed memorable success with his two-year-olds this season, and the son of US Champion Sire Distorted Humor was at it again on Friday. This time it was Pathfork’s 2yo daughter Madame Speaker who was to the fore, with that Alan Greeff trained filly capturing the Listed Lady’s Slipper Stakes at Fairview. Ridden by Teaque Gould, Madame Speaker powered home to score a three parts of a length win in the 1400m feature and stamp herself a leading contender for East Cape awards later in the year. It was a second feature race win for the Stanley Bennett bred filly, who had previously beaten males when victorious in the Listed East Cape Nursery. Madame Speaker, who is out of the National Assembly mare Word Perfect, has now won three of six starts, and has yet to finish out of the top three. 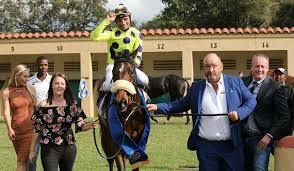 The filly was also second in the both Listed East Cape Fillies Nursery and Listed Dahlia Plate. 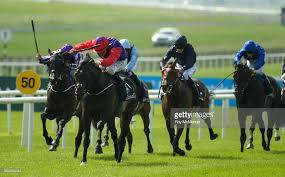 Her sire Pathfork, Ireland’s Champion 2YO Colt of 2010, is also responsible for this season’s G1 winning 2yo filly Mighty High (a leading Equus Award contender) and previous two-year-old stakes winners Red Chesnut Road and Precious Pansy. Bred on the same Distorted Humor/Sadler’s Wells cross as fellow G1 winners Aesop’s Fables and Cursory Glance, Pathfork hails from the same family as recent G1 Tattersalls Irish 2000 Guineas winner Romanised. He has seven lots on offer at next month’s KZN Yearling Sale –including Barnane (Lot 270), whose bred on the same Pathfork/National Assembly cross as Madame Speaker!